The history of LLA has been written by you; through your stories and experiences. If you would like to share your memories, I would greatly enjoy hearing them! I have enjoyed many stories from alumni...anything from favorite teachers to music trips and oh-so-many prank stories! I encourage you to reach out to me and share your story. You are a valued part of the LLA family for life! I welcome your comments, ideas, and questions and encourage you to contact me if I can be of service. Please feel free to call the office or e-mail me, or if you find yourself in the area, please stop by for a tour. Whether you were here for one year, or thirteen, you are still a part of the LLA family and we are always happy to see you! 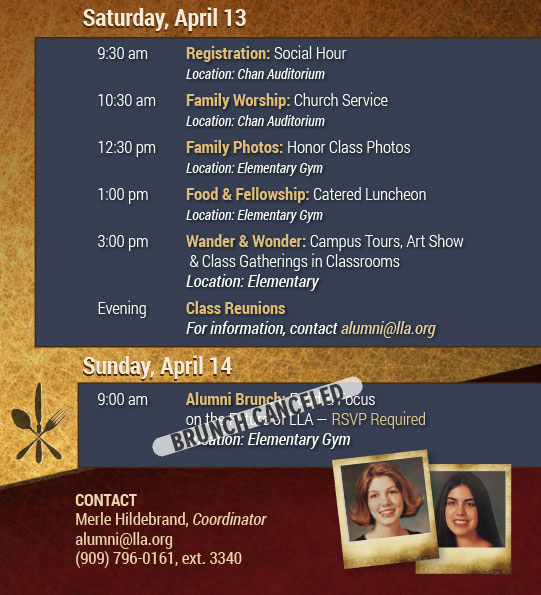 Please note that the Alumni Brunch on Sunday morning, April 14, has been canceled. How many will attend lunch? Join our Loma Linda Academy Alumni Facebook group for current alumni news, events, and to stay connected with your former classmates.